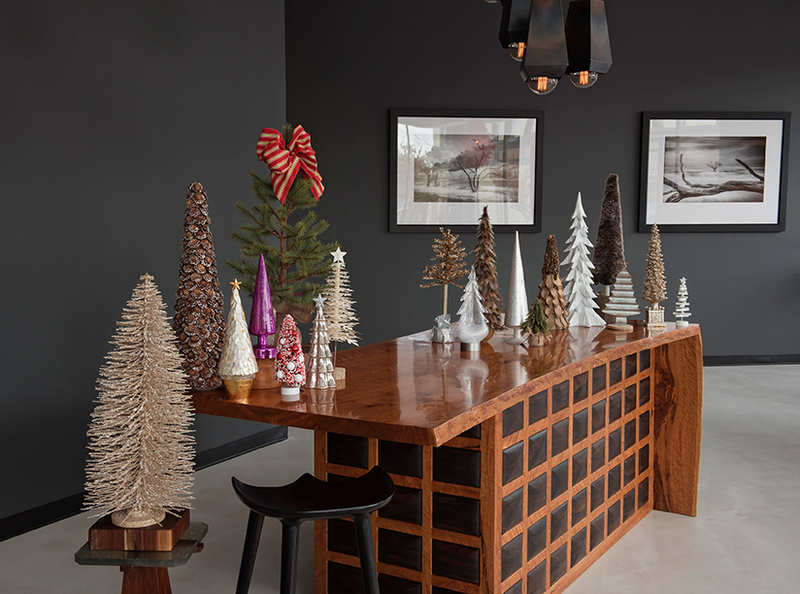 Bring the Christmas spirit into smaller spaces with a tabletop tree. 1. Silver and gold glitter tree, available at The White Rabbit. 2. Pine cone tree, available at The Great Cover-Up. 3. Cone tree on pot, available at The Great Cover-Up. 4. Colorful LED tree in purple, available at Savvy Surrounding Style. 5. Tree with burlap base and custom bow, available at Marketplace at the Abbey. 6. Bottle brush tree, available at The Gifted Gardener. 7. Mercury glass tree, available at Rusted Chandelier. 8. Paper tree, available at Rusted Chandelier. 9. Gold tree, available at Fleur de Chic. 10. Glass evergreen tree, available at Mary Tuttle's. 11. Feather tree, available at Mary Tuttle's. 12. Silver glitter tree, available at Savvy Surrounding Style. 13. Jute sack tree with gold glitter, available at The Jeweled Cottage. 14. Burlap and pine cone tree, available at The Jeweled Cottage. 15. White glitter wood tree, available at Savvy Surrounding Style. 16. Fur tree, available at Fleur de Chic. 17. Galvanized metal tree, available at Marketplace at the Abbey. 18. Gold planter tree, available at The Gifted Gardener. 19. White wood tree, available at The White Rabbit. 4. Colorful LED tree in purple, available at Savvy Surrounding Style. 5. Tree with burlap base and custom bow, available at Marketplace at the Abbey. 6. Bottle brush tree, available at The Gifted Gardener. 7. Mercury glass tree, available at Rusted Chandelier. 8. Paper tree, available at Rusted Chandelier. 9. Gold tree, available at Fleur de Chic. 10. Glass evergreen tree, available at Mary Tuttle's. 11. Feather tree, available at Mary Tuttle's. 12. Silver glitter tree, available at Savvy Surrounding Style. 13. Jute sack tree with gold glitter, available at The Jeweled Cottage. 14. Burlap and pine cone tree, available at The Jeweled Cottage. 15. White glitter wood tree, available at Savvy Surrounding Style. 16. Fur tree, available at Fleur de Chic. 17. Galvanized metal tree, available at The White Rabbit. 18. Gold planter tree, available at The Gifted Gardener. 19. White wood tree, available at The White Rabbit.